The Kuranda Riverboat operates interpretive river cruises and guided rainforest walks. Enjoy a memorable experience discovering Kuranda’s rainforest flora, fauna and history. Cruise the tranquil waters of the World's most ancient tropical rainforest on a 45 minute tour on the Barron River in Kuranda. There is a host of wildlife on the river and you may see freshwater crocodiles, snakes, fish, turtles, water dragons and tropical birds. Your tour guide will share his knowledge of the area with you while you relax and take in the beautiful rainforest and take advantage of many photographic opportunities. Their other tour is the Paradise Kuranda Guided Rainforest Walk, which is followed by tea/coffee and cake. You are taken to a secluded area of rainforest, which is only accessible via the Kuranda Riverboat. Your guide will take you on an interesting and informative walk through the tropical rainforest. Cruise the tranquil waters of the World's most ancient tropical rainforest. Enjoy a calm water cruise aboard the Kuranda Riverboat as it takes you on a 45 minute tour on the Barron River in Kuranda. There is a host of wildlife in and around the river and you may see freshwater crocodiles, snakes, fish, turtles, water dragons and tropical birds. Your tour guide will share their knowledge of the area with you while you relax and take in the beautiful rainforest and take advantage of many photographic opportunities. Tours depart at 10.45am, 11.45am, 12.30pm, 1.30pm and 2.30pm. They operate five tours a day, seven days a week. Talk to them about group bookings and special tours outside of their normal tour times, including sunset tours. The Kuranda Riverboat can also be hired for small wedding ceremonies. To take part in one of their guided rainforest walks you will hop aboard the Kuranda Riverboat and cross the river to a secluded rainforest clearing where you will be taken on a guided interpretive walk through a section of beautiful tropical rainforest. Sometimes cassowaries are spotted in the rainforest too. Tea/coffee and cake are served in their outdoor rainforest tea room using beautiful bone china tea sets at the end of the walk. 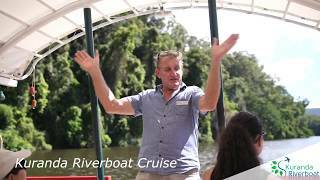 At the end of the tour you will board the riverboat again, which will take you back to their jetty and Kuranda village. Groups can also enjoy a curry lunch in the rainforest including drinks, followed by a cruise on the Barron River. Talk to them about your requirements for something special like this.